Northern jaçana Jacana spinosa, photographed by D. W. Baker. The Jacanidae are the jaçanas, extremely long-toed birds found around vegetation-filled water bodies in tropical and subtropical parts. Their long toes allow them to walk on the surface of floating vegetation such as waterlilies and lotuses. Jaçanas also possess a frontal shield above the beak, and sharp horny spurs on the bend of their wings (Austin 1961). They are often strikingly coloured. 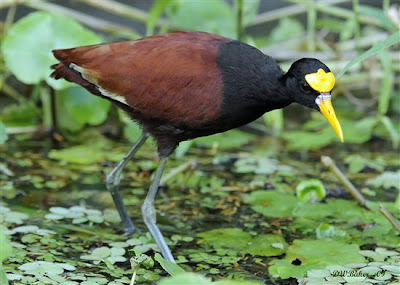 Species of the type genus Jacana, found in the Americas, are black with chestnut-brown wings and back; the wattled jaçana Jacana jacana has red wattles behind the bill in addition to the red frontal shield. [ME04] Mayr, G., & P. G. P. Ericson. 2004. Evidence for a sister group relationship between the Madagascan mesites (Mesitornithidae) and the cuckoos (Cuculidae). Senckenbergiana Biologica 84 (1-2): 1-17.